Small things can certainly make or break my mood for the whole day- Great quote. Without drops of water the bucket never fills up, either! Great quote Lance. Without little things there never can or will be big things. And if we don’t appreciate the little things, we won’t appreciate the big ones either. Really listening, saying thank you to someone for something small, spending quality time with your loved ones. If we don’t do such small things, we risk not being happy. And happiness is the big thing isn’t it? That’s true 🙂 we often underestimate the value of little things. In The Butterfly Effect I discussed in wonder how the fluttering of the small wings of a butterfly could actually affect the path of a Tornado from miles away! And that is scientific. Let us not underestimate the day of little things, they might have a big impact after all. Collectively, little things can create major changes. I’d also like to think that if we all play our small part in creating joy, the world will be much a better place. Thanks for the inspiration!! I think that everything has consequences and an impact. And we can never know how big that impact can be. LifeMadeGreat | Juliet´s last blog post..What Are You Thirsting For? A PERSONS A PERSON NO MATTER HOW SMALL. I look forward to these sunday thoughts, Lance. Agreed. I don’t think that there are little things at all. Everything counts – the ripples and vibrations of our actions and thoughts continue on indefinitely influencing others according to how they are received. @SnaggleTooth – Great way to look at it – it’s the drops of water (the things that might seem small) that if we keep doing, keep adding to the bucket – our bucket will overflow (with goodness). @Mimi – Yes, if we are to think in terms of what is typically thought of as big or little – happiness would be one of those big things. And yet – how do we get that – it’s all the things we do, day in and day out (what might seem like smaller things) that get us to this thing that seems bigger (happiness, in this case). Great example Mimi! @Evelyn – I believe you’re right on here, Evelyn! If we all did some “little” act of creating joy, every one of us throughout the world – it would be a revolution of magnificent proportions! Individually, this would all seem very small yet collectively, the small gestures of joy would have the ability to change the world! Great quote! I agree, everything is important. Some of the biggest accomplishments in life started with the with the smallest of steps. I decided to quit smoking at age 27 and began running. Six months later my husband quit as well and joined in the running. We also brought the 4 girls along to do the fun runs and wait for us at the finish line. Today we have 1 runner, 2 walkers, one works out at the gym and one triathlete, one who only occasionally works out. 2 are in sales for an athletic shoe company… One Little Decision! The only little things that exist are those that we think are little. Good reminder that we almost are never able to see the bigger picture, but just because we can’t, doesn’t mean that huge consequences doesn’t exist. I love the image and how it fits with quote. The ripples that can come from a little comment or a big event sends waves throughout all our lives. I believe that everything is connected. When we realize that everything matters that’s when we can live the life that fulfills our needs. Karl – Work Happy Now´s last blog post..How Do You Define Success? I love the magic of your Sunday Thoughts. No little things – sometimes one little comment on my blog, especially in the early days, helped me keep going instead of giving up… we just never know what our little actions might mean. Hi Lance, I have a different thought. I am a strong believer in little things and if we do the little things consistently, then they will bring tremendous consequences, so there are always little things. I don’t know, maybe it is just different words, but has a same meaning. What do you think? What a profound thought and a great image to pair with the quote!!! Absolutely LOVE the “drops of water filling the bucket” comment as well! Those seemingly insignificant drops do add up!!! There are no little things in life. Everything is made up of a lot of little things. So, I would say all little things are a part of something BIG. Giovanna Garcia´s last blog post..Imperfect Action is now on Alltop! Consequences- I’ve been thinking about them the last few days. As you know Lance, I have been to hell and back the past several years with some family issues. Now I am on the other side of that trip looking back on it and working through the pain of the journey. What have the consequences been? I could rattle off a list of painful consequences that paint me as a victim and tug at everyone’s heart but I want to focus on the most important consequence. God used my trip through hell to shine a light directed right at me. I was able to see this light and move toward it. Isn’t it amazing that light shines the brightest in the dark? God promises to make something good from the bad and he really came through on this promise for me. He used all the pain and uncertainty in my life to show himself to me in a powerful way and draw me closer to him. So now that I am in a much better place, I can thank God. Not so much for allowing me to travel such a terrorizing trip but that he did not waste my pain. So was it worth it? On this side of it I say yes. During the pain, escaping the pain was foremost on my mind and I don’t know if I could say yes then, I am too weak of a person. But knowing where I am in my relationship with God now verses before, I am thankful for God to use it and bring me closer to him. I always look forward to your Sunday Quotes. This one hits a chord with me. I try to be aware of each and every experience and decision, as we can learn so much from the little things that life gives us. As routine takes us over, we go into auto-pilot and miss so many amazing things around us. Thanks Lance! Rupal´s last blog post..Let’s do the twist! Hi Lance. This is just like the ripple effect of blogging. One blog post can touch so many people. Little things can be stepping stones and little things can grow beyond measure. What may be little to me may be enormous to you, etc. @Tess – That’s a great example, Tess! How replacing a bad habit with a good habit can have such a positive impact on others. Since I can relate very much to this story (I compete in triathlons and 5K runs) – I hope that I am passing this on to my children. That someday I’ll be able to look back, like you have, and realize what an effect this was – when I did start running/biking/swimming — being more active. One little decision, so many benefits for so many people! @Very Evolved – What we think is little – good point Patrick. And so, even though we often won’t see the big picture – we should act as though our choices, our actions have a much bigger effect that what we see right in front of us… Great thought! @Karl – I agree, Karl, on just how well this image fits the quote. 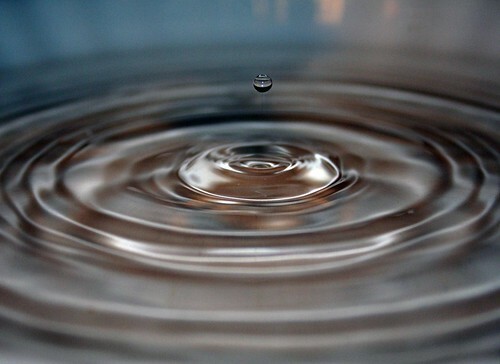 The ripple effect of what our choices and actions can do. Everything does matter – so well said! @Arswino – I think this is definitely the same meaning, Arswino. Some things are indeed smaller – yet the consequences of them can be far reaching. And in that, they can be huge. Take the example above from Daphne. To one person, leaving a simple comment is something small – yet to the receiver, it can be huge beyond measure. @Kathy@Virtual Impax – The image and quote go so well together, don’t they! A small drop may not seem like much, yet, with enough of them – they do overflow the bucket. Think of those little drops as, say, acts of kindness, and as you give it out (kindness), you continue to fill your bucket – until it is virtually overflowing with kindness coming from you (as in, you’ve done it so much, it’s become second nature). And that is very awesome! @Chocolatecoveredvegan – Thanks, glad to hear you like this!! @Giovanna – “little things are a part of something big” – that is a powerful way to look at this, Giovanna! And it really speaks to the idea that all that we do – really is part of something more, something greater, and something worth doing it right for. @Rupal – That’s a great observation, Rupal. Being on “auto pilot” can cause us to miss so much around us – the little things that maybe we take for granted. And yet, taking time to stop and really experience, really “be” – can have huge effects on our lives, and the lives of those around us. Thanks, Rupal! @Davina – Yes, awesome example Davina. We write words, and they may seem like they are not worth publishing, not worth submitting. And yet, those words can be just what someone needs to hear, something that someone has been searching for…. @Stacey/Create A Balance – Exactly! What’s little to one person, can be huge to someone else – and that’s a very powerful thought – and can have such far-reaching impact. Thank you, Stacey! @Annette – As a mother, you have the opportunity to really set your children into a certain direction. And a lot of that is done by all the little things that happen day in and day out. Continue to love and care for your family, Annette. You are giving them all the stepping stones to a great life ahead of them! Hi Lance: This reminds me of the rhyme that says in part “for want of a horseshoe nail a kingdom was lost”. Small actions can definitely result in large consequences. It is amazing that light shines through the darkness. The little things loom so large when we are confronted with stress, a diagnosis, divorce, death. Yet, later, those large things that loomed so big, become small ripples in life. And through it, we might discover something about ourselves, or we might write a book, as I did, or find something that ignites our passion, as I did also. I just started reading your blog, and I love it. Hi Lance – I love how you matched the “ripple affect” with the quote. It’s perfect. This is another great reminder of what we do/say often has a greater affect than we can even begin to imagine. It’s all in the small things!!!! Absolutely – there are no small things, really. It’s all part of the plan, no matter how large or small. It’s like the saying “bigger isn’t always better”. Yet in our minds that is what we often believe. Appreciate every little, big and medium thing, moment, or person. Very thought provoking quote … I think the sensationalism of the media and video games have encouraged us to live in pursuit of the ‘biggie’ moments of life, but there are FAR more meaningful moments in between the biggies. Tammie @ Are You For Real?´s last blog post..How To Use Blessings? Tremendous rewards also come from little things. I think the most important thing about the quotation is to remember how important details and snall gestures are. Especially for our loved one’s. What a great quote and its so true. Nothing can be considered “little” since it all has the potential to snowball into something big. Wonderful quote. I just had this conversation with my teen today. I was trying to explain to him that no matter how small something may seem to him to others it might be big. Treat all things the same and you will never let yourself or others down. Cricket´s last blog post..Oh where have I been? @Marelisa – Hi Mare! That rhyme is so fitting here! Small actions really can have consequences beyond what we think. How often do we forget that? @Tammie – Great point here, in that those “big” moments, though we may have them, are not everyday occurrences. And it’s the moments in between these big ones that really have an impact – the smaller things that happen day in and day out. @Success Factors – Just like CG said up above, one snowflake, when combined with many, becomes a force to be reckoned with. Thanks Derek! @Cricket – Tammy, what a good conversation to have. I wonder, when we have these conversations, how much is being retained. Maybe if we say it enough, and more than that, if we “do” it enough, the point will get across. Anyway, I think that’s great – you taking the time to have this talk. Excellent Lance…all things can be as big or as small as we make them, but what never changes is that they all have consequences. And again to some that same consequence may be a big deal and to others a very small deal. No matter what our actions always impact someone out there and that is enough to seriously consider each of our actions before following through. It’s rarely the big things that we believe make the difference in our lives. It’s the multitude of tiny expressions of love to one another that matter and add up over the course of our lives. Do small things well….you never really know! I spent my day hiking near the beautiful ocean its vastness its abundance of these water droplets. Today the whales were passing by, a spout here and there everyone was so joyfully watching them on their journey to the southern waters. Later as I sit there soaking up the misting air next to the waves crashing near me and watching the sparkling water droplets of the waves that glistened in the sunset of this day. I sat in grateful wonder and gave thanks for this day to God for its nourishing me. Bright and smiling faces surroundied this joyful day. Water drops in the bucket as vast as the oceans we may be filled at times….to share , to give, to extend to each that touches us in our lives…thank you so much for your Sunday Thought of the Day for today, Lance! You are always helping me to keep the flowing elements on this day and even more. Thank you! Well, Lance I do have to say that this quote does go VERY well with a consistent theme of yours. One lesson that I’m still learning is the importance of the “little things.” It’s a VERY valuable lesson that I’m learning from you and your writings and it’s making an impact on my life. It’s the little things that make up the big things that make up our life – whether good or bad. When we choose good – the little things can make a huge splash in this world. Thank you Lance for teaching such important lessons like this! There are no big things. Yikes. This one is dangerously powerful. The idea that even the smallest things can affect us in a big way is a bit scary. It makes me want to be more careful in how I treat people, what I say to them, and how act towards them. I love Sundays! From little things big things grow, that is what mostly happens in life. Occasionally some things/people don’t grow or blossom. Thinking small, we may stay little. @Diane – First off, Diane, I want to let you know what a wonderful picture you’ve painted in my mind – of the ocean and all its beauty. So large and expansive, yet made up of drops of water – not insignificant at all! It is the small things we do, day in and day out – that make such a difference. Thank you for your continued visits, and thank you for your very kind and generous words today. They are all very much appreciated. @Jennifer – Thank you, very much, Jennifer. And a great point – the little things – they can be good or they can be bad. Both have consequences, although those consequences can be good or bad as well. Choose good! I know you do! And I love how you’ve said that – “choose good – the little things can make a huge splash in this world!”. This is so true, and the image I’m getting in my head is one of much joy and fun (with a big splash being made!)!! @Angel – It can be a bit scary, yes. Yet, it can also be extremely rewarding when we really think about what our actions can do. This is especially true for how we treat others – what seems small or insignificant to us can be so big for someone else. Thanks for coming by today Angel! @Henie – I’ll have to check out what you wrote about this…you’ve piqued my curiosity! And, again – thanks for adding one of your quotes to this – in the little things we do, especially, I think, for others – we begin to feel big too! @Miruspeg – Hi Peggy. Reading what you’ve written, I think of a seed. What starts as a seed, can grow into something much bigger – take a tree for instance. Like life, the seeds of goodness that we plant really can grow into something much bigger. I love that thought! I love this quote and feel it can be another call to consciousness. It is very easy to overlook the little things if you are walking around on auto-pilot. But those little things might need to be noticed and acted upon for the next step to be made clear…. It also made me think of gratitude…. Sometimes people don’t take the time to be grateful for those little things. But in that brief moment of acknowledgment you will not only feel a lot better about the world around you but will be opening your heart up for even bigger things to come into your life. Little things done over time can definitely bring some big results. That picture goes perfectly with the quote. That one little drop effects everything around it. Hey Lance, I thought you selected the perfect picture in line with the quote! It really fit the whole message. Indeed, sometimes it’s really the little things that matter and ripple out to create a whole chain of other events which we are not even aware of at the on-start. That’s one of the reasons why I find life so amazing 😀 It’s so full of surprises! I remind myself of this every time I take a little step towards my goal of being published. All the little things make up one big thing. And to accomplish the big thing, start with something little. This is the advice I’ve given myself and my children. When a task seems overwhelming, just start small and slowly chip away at it. Soon enough, the big thing starts to look much smaller. Thanks for the great quote, and excellent picture representation, Lance. Cause and effect teaches that every action has an equal and opposite reaction. Of course, human minds do not always have insight into the nature of effects simply because people do not truly grasp underlying causes. This reminds us how much learning remains to be done. Ah–the timeless joy of exploring a mystery! Very insightful quote. Yes, it is true, all things effect us in both little and grand ways. Every movement we make, every thought we have creates a ripple in time and space. Beautiful! All the little things contribute to the big stuff. So it’s true… there really are no small things. Love these quotes. Wow Lance, I have been pondering about this quote since I read it yesterday. Except for the word consequences this quote makes me think of the little things that we can do for people. Small kind gestures that when paid forward could possibly change someone’s life! Showing someone that they matter, a simple smile and letting someone go ahead of you in line. On the flip side, consequences conjures up bad things, cutting off somebody while driving because your in such a hurry and can’t be bothered to let someone out in front of you..seemingly inconsequential, but if paid forward could have the potential to ruin somebody’s life. Natalia Burleson´s last blog post..Dern Veggies! Update week 3 goals. There are no small things…now this is food for thought! Caroline´s last blog post..Who are you? @Jenny Mannion – Hi Jenny! It IS easy to overlook the little things (I do it way too often). The whole concept of gratitude related to this is a wonderful look at what can be. In appreciating the little things in our lives, we do open ourselves up for great things when they come. @Broderick – The idea of “done over time” is powerful – little can become big with the passage of time. @Mark/Mark Salinas – Thanks Mark! @Jewel – That’s great, Jewel! It starts with a single word. Indeed, it has for every published book. You’re getting there, one step at a time – and that’s very cool! @Liara – Grasping underlying causes – or – seeing the bigger picture in the small day to day things. This is not always easy to understand. It can seem abstract, that which we can’t always visualize. Working toward that end, though, can be a very rewarding experience. @Mark/ToBeMe – Thanks Mark! And, yes, looking at it this way – everything we do, every move we make, causes a ripple. Where that ripple will go, we can’t really know for sure. @Sagan – Yes, the things we think are small…really are just part of something much bigger…always. @Jeremy – “Don’t sweat the small stuff” – hmm…interesting thought Jeremy. If it all counts, maybe we do need to sweat some of these small things a bit more. At least, listen for a real answer on what we should do… This is something worth pondering, thanks! This is the quote that started my commonplace book. It was the first time I saw a quote other than a song lyric that I felt I had to keep and remember. Thanks for sharing. I share my commonplace book collection on my sister blog, Thoughtful Cacophony. Check it out if you get a chance. It’s amazing how the littlest thing can have major consequences isn’t it. It’s kind of funny, or rather sad that people don’t realize this. I suppose that most people don’t really realize this simple point, but I wish they would. You never know when just saying “Hey!” could potentially turn their day around and save them from making a terrible choice. Wow Lance – look at the comments – a little quote and you have a sea of comments …is the quote “little” after all? You have enough material to write a paper right here 🙂 – you and your blog is a perfect reflection of the quote ! Yes, and all things matter, in the universe’s interconnectedness. This is so true. Some of the smallest decisions can have tremendous consequences in your life. Though you don’t wan to make a big deal out of every little thing, we do have to consider our choices in life. @Chase – This is such a powerful quote – it says so much to what the little things, how important they truly are. I’ll be over to check out what you’ve got! @Maya – You’re right – this quote isn’t little at all! And the comments prove that! Thank you, Maya, for this, and for all your continued support. @Jannie – Right! There is this interconnectedness – among all things…and with that, everything matters. Everything. I believe that I and each and everyone of us are a result of the sum of billions and billions of little decisions and events made by every one of our ancestors. If any single one of those had not happened then I would not be here today. I could not have been conceived on any other moment than the precise moment on which I was conceived. And that moment was the coming together of an inconceivably large number of small steps made by an inconceivably large number of people. Indeed there are no little things.